Ebeko (Russia). KVERT reports an increase in activity on 2 July, with explosions producing ash plumes that rose to 1.8 km a.s.l. and drifted SSE. The Aviation Colour Code level was raised to Yellow. Gorely (Russia). KVERT reported that during 24 June-2 July seismic activity was above background levels, further increasing on 28 and 29 June. Analysis of satellite imagery showed a thermal anomaly during 24-28 June; cloud cover prevented observations on other days. A gas-and-steam plume drifted 35 km S on 28 June. The Level of Aviation Colour Code was raised to Yellow. Tiatia (Russia). SVERT reported that a thermal anomaly was detected by satellite on 25 June. Ulawun (Papua New Guinea). Darwin VAAC reported that during 1 and 2-5 July ash plumes drifted 55-195 km at 3 km a.s.l. Arenal (Costa Rica). OVSICORI-UNA reported that during June activity from Crater C consisted of gas emissions, sporadic Strombolian eruptions and occasional avalanches. Some of the Strombolian eruptions caused glass to vibrate in buildings located 4 km N. A lava flow that began in mid-January remained active on the S flank. Avalanches from edges of the lava flow and from the N and NE crater rim descended multiple flanks. Acid rain and small amounts of ejected pyroclastic material affected the NE, E and SE flanks. Small explosions of gas and occasionally ash originated from a vent N of Crater C while Crater D produced only fumarolic activity. Bagana (Papua New Guinea). Darwin VAAC reported that an ash plume rose to 2.4 km a.s.l. on 4 July and drifted 75 km W.
Dukono (Indonesia). 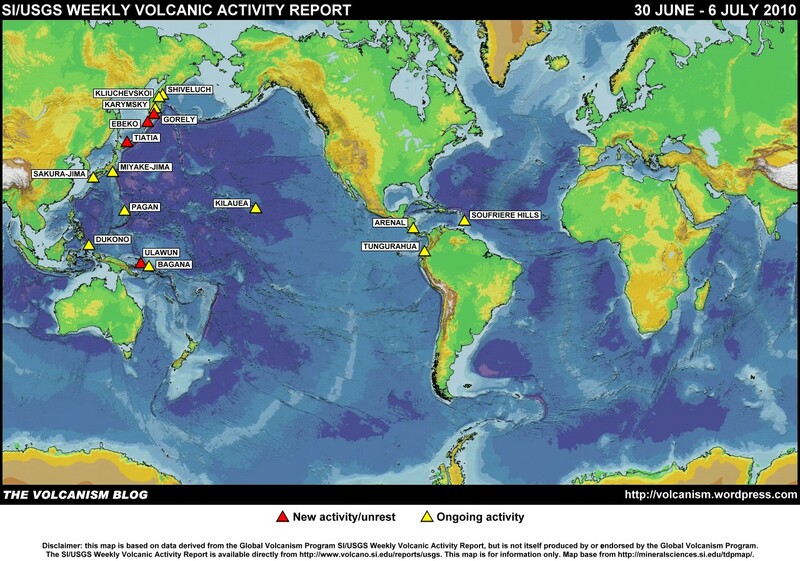 Darwin VAAC reported that during 30 June-2 July and on 6 July ash plumes rose to 2.4 km a.s.l. and drifted 90-225 km W and NW. Karymsky (Russia). KVERT reported that during 25 June-2 July seismic activity was above background levels and suggested that possible ash plumes rose to 7 km a.s.l. A strong thermal anomaly was detected in satellite imagery on 27 June; cloud cover prevented views of the volcano on other days. The Aviation Colour Code level remained at Orange. Kilauea (Hawaii, USA). During 30 June-6 July HVO reported that activity continued from the summit and the east rift zone. At the summit the level of a lava-pool surface in the deep pit inset within the floor of Halema’uma’u crater remained mostly stable; glow from the vent was also visible at night. A plume from the vent mainly drifted SW, dropping small amounts of tephra and occasionally fresh spatter downwind. At the east rift zone lava flows that broke out of the TEB lava-tube system built up a number of rootless shields between 580 and 395 m elevation. Thermal anomalies detected in satellite images and visual observations showed that minor lava flows originating from the shields traveled as far down as 365 m elevation on 1 July. A gas vent on the E wall of Pu’u ‘O’o crater was incandescent during most of the reporting period. Kliuchevksoi (Russia). 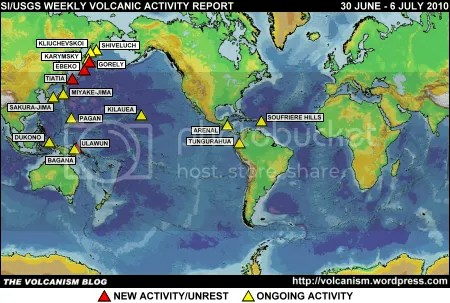 KVERT reported that during 25 June-2 July seismic activity was above background levels and Strombolian activity was observed on 24 and 29 June. Ash plumes occasionally rose to 5.3 km a.s.l. Satellite imagery analysis revealed a large daily thermal anomaly from the volcano and an ash plume that drifted 32 km S on 1 July. The Aviation Colour Code level remained at Orange. Miyake-jima (Japan). Tokyo VAAC reported a possible eruption on 4 July. Details of possible resulting plumes were unreported. Pagan (Mariana Islands). Minor gas-and-steam plumes continued to be observed in satellite imagery during breaks in cloud cover from 25 June to 2 July. Washington VAAC reported that on 5 July a small cloud of ash mixed with a gas plume was observed in satellite imagery. The Aviation Colour Code remained at Yellow and the Volcano Alert Level remained at Advisory. Sakura-jima (Japan). Tokyo VAAC reported that during 30 June-1 July and 4-6 July explosions sometimes produced plumes which, along with ash plumes occasionally seen by pilots, rose to 1.5-4.6 km a.s.l. and drifted E and SE. Shiveluch (Russia). KVERT reported that during 24 June-2 July seismic activity was above background levels and suggested that possible ash plumes occasionally rose to 6.6 km a.s.l. On 24 and 29 June ash plumes from hot avalanches rose to 4.5 km a.s.l. Strong fumarolic activity was also noted on these days. On 1 July seismicity increased and may have indicated ash plumes rose to 8 km a.s.l. Ashfall was reported in Klyuchi village, 50 km SW. Satellite imagery showed a large daily thermal anomaly over the lava dome. Tokyo VAAC reported that on 3 July an ash plume rose to 6.1 km a.s.l. and drifted N. Satellite imagery showed a possible eruption the next day. The Aviation Colour Code level remained at Orange. Soufrière Hills (Montserrat). On 28 June MVO reported that for the first time since February 2010 ash venting from the lava dome was observed and caused light ashfall in several areas across Montserrat. Ash venting began on 25 June and was coincident with small swarms of volcano-tectonic earthquakes on 23 and 25 June, although with no other discernable associated seismicity. Observations initially from MVO staff and during a later overflight indicated that the ash venting occurred from inside the collapse scar (near the N rim of English’s crater) and from the S part of the summit crater that had formed on 11 February. On the nights of 25 and 26 June audible roaring was heard from several locations on the island. Ash venting diminished on 28 June. The Hazard Level remained at 3. Tungurahua (Ecuador). Observations of the summit area during 30 June-6 July were mostly not possible due to inclement weather. On 2 July gas plumes were seen drifting WSW during breaks in the cloud cover. Ashfall was reported in areas 8-9 km W and SW, and as far away as 40 km WSW in San Juan. Incandescence from the crater was seen at night and slight roaring was heard. Ashfall was again reported in areas 8-9 km W and SW during 3-4 July. Steam-and-ash plumes were seen on 5 July and rose to 7 km a.s.l. Ash fell in areas 8 km to the SW. Steam-and-ash plumes were again seen on 6 July; ashfall was reported in areas 8 km W, NW and N.
The foregoing is a summary of the Smithsonian Institution/United States Geological Survey Weekly Volcanic Activity Report covering 30 June – 6 July 2010. It is provided for information only, and is based on but not a substitute for the full report, which comes with its own criteria and disclaimers. The map base is derived from the Smithsonian Institution/USGS/US Naval Research Laboratory This Dynamic Planet website.